La Bella, Käthe Kruse new full vinyl dolls. Slim girls of 42cm in wonderful modern outfits. Käthe Kruse La Bella Aimee, 42cm. La Bella Aimee is a 16.5 inch. standing doll made of high quality vinyl. She has hand-painted brown eyes and long, shiny brown hair with pony from Kanekalon . She wears a fashionable dress consisting of a top in red striped single jersey with attached pleated skirt in marine with star print. 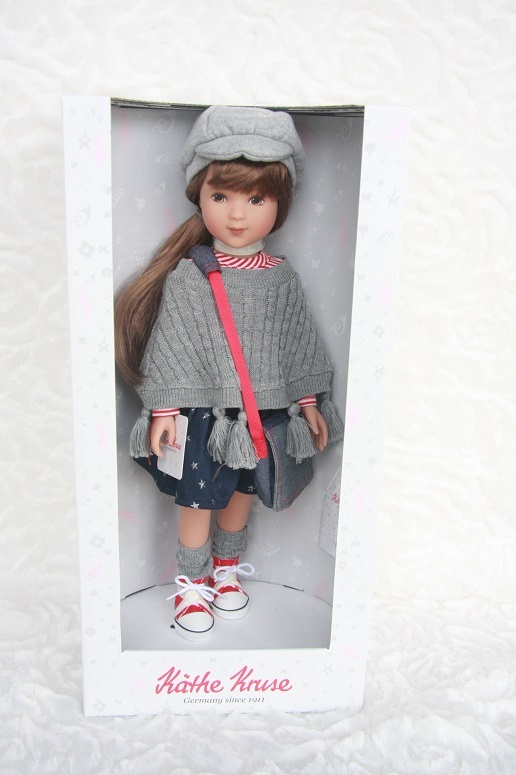 She also wears a knitted gray poncho, matching knit calf warmers and a cap. Her college bag and the red chucks complete the outfit. Käthe Kruse La Bella Darcy, 42cm. 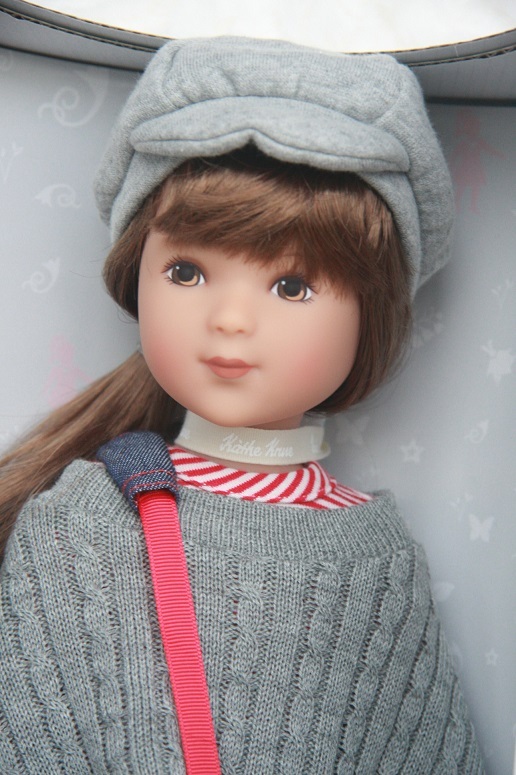 La Bella Darcy is a 16.5 inch. doll made of high quality vinyl. She has hand -painted blue eyes and long, silky, shiny blonde hair from Kanekalon. Darcy is already dressed for a ballet lesson. She wears a pink panné velvet dress with a multi-layered tulle skirt and a pair of pink tights with gray calf warmers. She brings her own backpack for her things. La Bella Hazel is a 16.5 inch. doll made of high quality vinyl. She has hand -painted blue eyes and long, curly, shiny blonde hair made from Kanekalon. 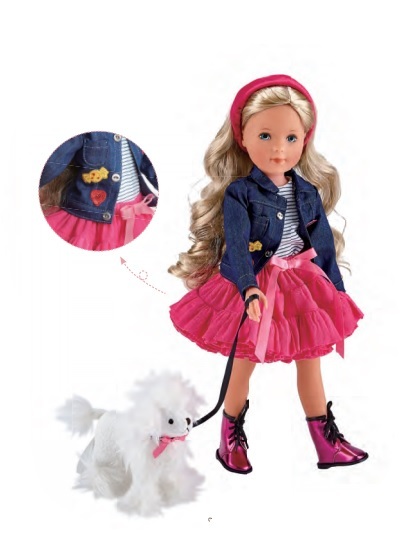 She is elaborately dressed with a gorgeous multi-layered tulle skirt in pink, a striped shirt and a denim jacket with patches to walk her sweet poodle. Matching her outfit, she wears pink patent leather boots with a metallic effect . La Bella Irene is a 16.5 inch. tall doll made of high quality vinyl. She has hand-painted brown eyes and long, shiny brown wet-look hair from Kanekalon. Safari is the topic here! 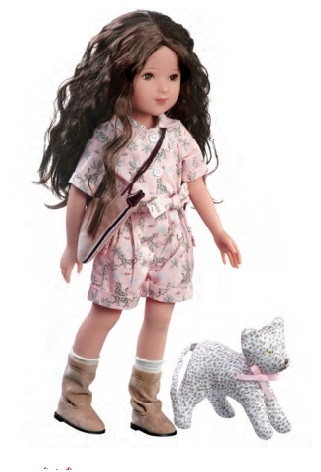 She is accompanied by her tamed leopard in her pink leopard-print one-piece, striped jersey calf warmers, suede-look boots and an authentic water bottle. Käthe Kruse set La Bella School outfit, La Bella 42cm. This fashionable dress consists of a top in red striped single jersey with attached pleated skirt in marine with star print. On top there is a knitted gray poncho, the matching calf warmers and the chic cap. Käthe Kruse set La Bella Party outfit, La Bella 42cm. 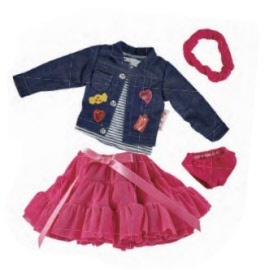 This outfit consists of a gorgeous tulle skirt in pink, a striped shirt and a denim jacket with patches. Dressed like this you can be seen at every party. Käthe Kruse La Bella ballet shoes pink, La Bella 42cm. Every doll that dreams of becoming a dancer needs matching pink ballet shoes. Käthe Kruse Boots pink metallic La Bella, 42cm. These pink boots make any outfit particularly chic and striking. Käthe Kruse Chucks red La Bella, 42cm. Especially matching are these red chucks for all occasions. Käthe Kruse La Bella Chucks gold, 42cm. Especially matching are these golden chucks for all occasions. Käthe Kruse La Bella boots beige, 42cm. 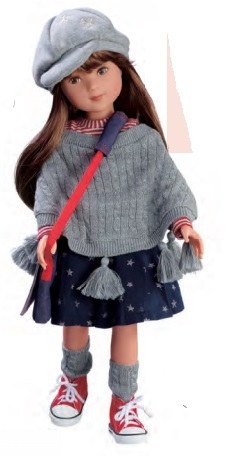 With these chic suede boots, every doll is perfectly equipped for all weather conditions. Käthe Kruse La Bella Ballerina gold, 42cm. These golden ballerinas make every dress prettier. Käthe Kruse La Bella Ballerina silver, 42cm. These silver ballerinas make every dress prettier. Käthe Kruse La Bella sneakers white, 42cm. White Sneakers always fit well to different outfits. Käthe Kruse La Bella Sandals gold, 42cm. Every summer dress will be more beautiful with these chic golden sandals.